The purity of Pearls combines with the protection of an Angel in this powerful Aventurine necklace designed to to help instil an inner confidence in the wearer so they can achieve their goals. This lovely necklace is composed of soft green Aventurine stones and contrasting Pearls. It also features a small metal guardian Angel. A silver-plated lobster clasp with 2" extender chain (finished with a tiny metal flower), and organza ribbon completes this very special piece of jewelry with meaning. A truly impressive piece of jewellery for protection, and said to instill calm and confidence. Ideal as a travel gift, or to encourage dreams, or as a gift for inspiration. Comes gift-wrapped, like all our presents - and we can print a personal message on your behalf. More information about Guardian Angels . .
AVENTURINE is so well renowned for luck and goal achievement, it is called The Gambler's Stone. 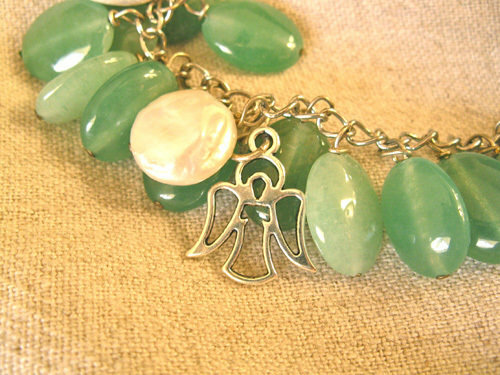 If a dream is worth pursuing, Aventurine is the stone to help. But it is also believed to be especially helpful in reducing stress, relieving anxiety and calming the emotions, bringing about inner peace - just like Pearls. For this reason it is used by therapists to relieve stress and depression . . a potent gemstone for those suffering emotional discomfort, and good for those in stressful situations. Aventurine is also believed to reinforce peoples' decision-making abilities, amplifying leadership qualities and enhancing creativity and developing confidence . . the ideal gift for those going for an interview or to an important meeting, and bringing luck to entrepreneurs and those seeking difficult goals. Aventurine is the anniversary gemstone for the 8th year of the marriage. PEARLS offer the gift of Honesty, Purity, Wisdom and Integrity. The Pearl has been a popular gem from ancient times as a symbol of peace and purity - lifting people's spirits and making them feel calm and dignified. A gift with a Pearl is perfect as an engagement present. Pearl is also the anniversary gem for the 3rd year of marriage. More information about the good luck properties of Pearls . .